1% fresh harvested whole cranberries! Let me explain. 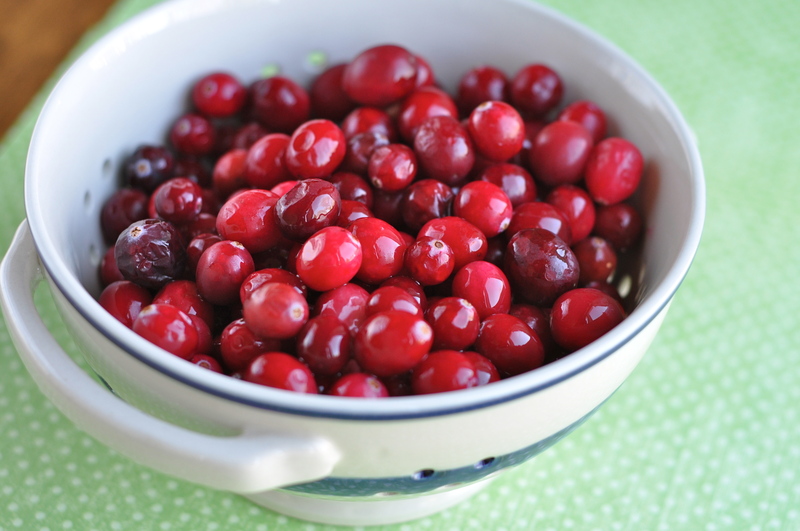 I love everything about whole fresh cranberries – the bright vibrant red color, the intense, acidic pop in your mouth when you eat them and let’s not forget they grow in BOGS!! 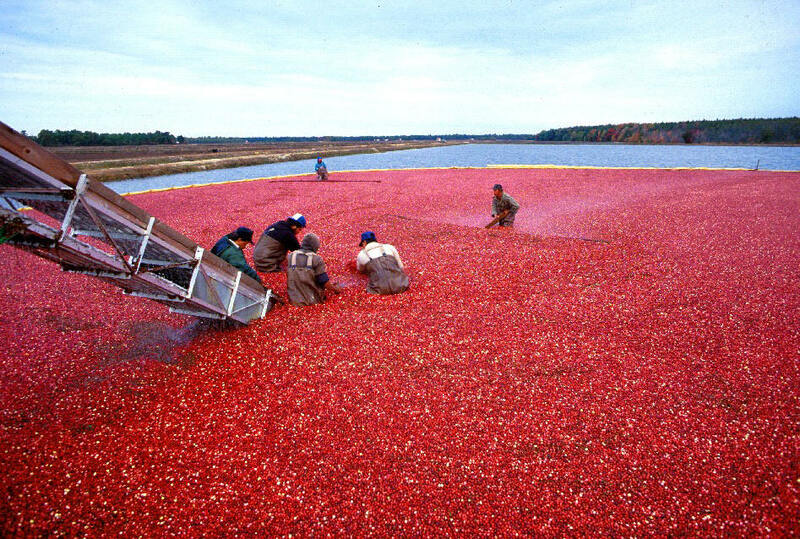 Freshly harvested, whole cranberries are always my first choice. I wish these delightful, refreshing, sour nuggets of deliciousness were available more often. But alas…..the only time I see fresh, whole cranberries in our produce section is around the Holidays. The rest of the year I am relegated to Cosmo consumption. 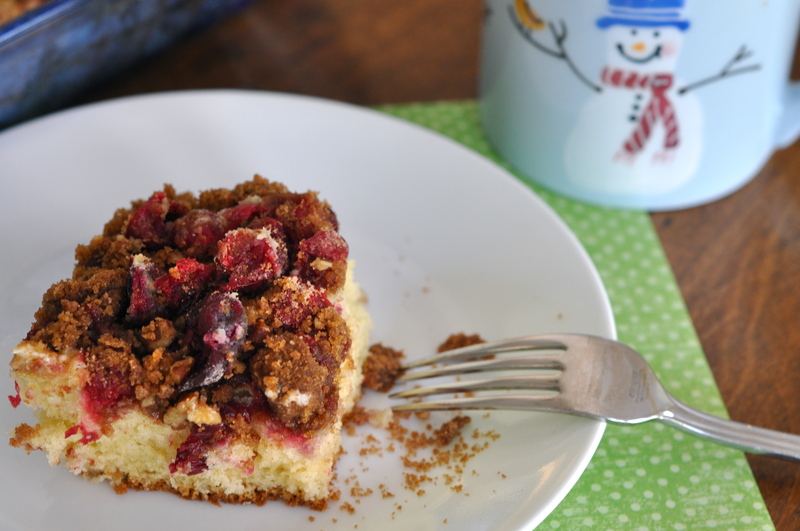 When fresh whole cranberries arrive each autumn I always make this sour cream streusel coffee cake first. 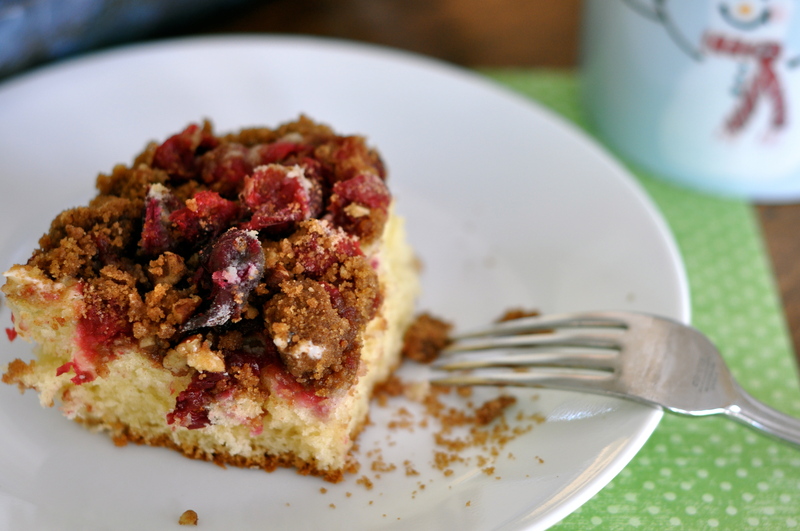 This light, fluffy sour cream laced coffee cake topped with contrasting bright, acidic, whole fresh cranberries and pecan caramel streusel makes your mouth water. It’s great as a morning coffee cake, but is so satisfying and rich it makes a great dessert too. Preheat the oven to 325 degrees. Butter and lightly flour a 9 by 13 inch baking pan. 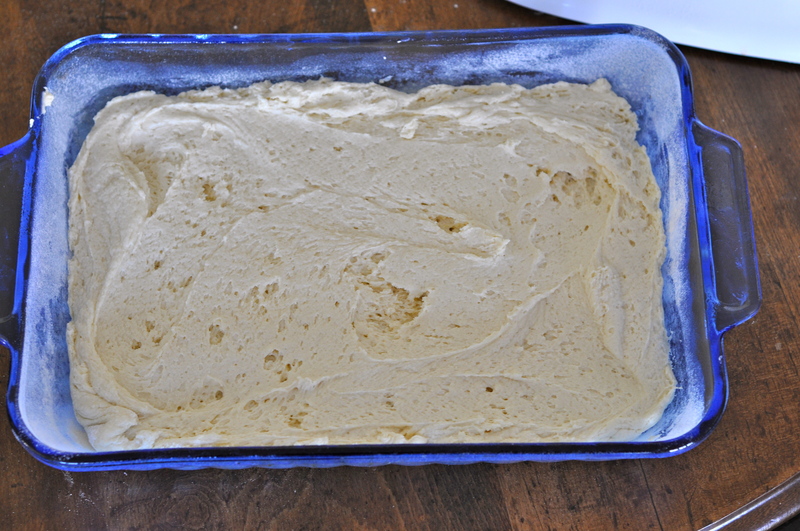 To prepare the coffee cake, cream 1 stick of butter in the bowl of an electric mixer and beat until light and fluffy. Add 1 cup sugar and beat again until light and fluffy. Beat in the eggs one at a time. Add the vanilla and freshly grated orange zest. On the side, sift the flour, baking soda, baking powder and salt together. I like to sift my dry ingredients together onto a sheet of parchment paper. Then when it is time to add the flour mixture to the batter, I pick up two sides of the parchment paper, position it over the mixer and pour the flour mixture in. Flour can compact and become dense when it sits in the storage container, that's why it is important to sift. 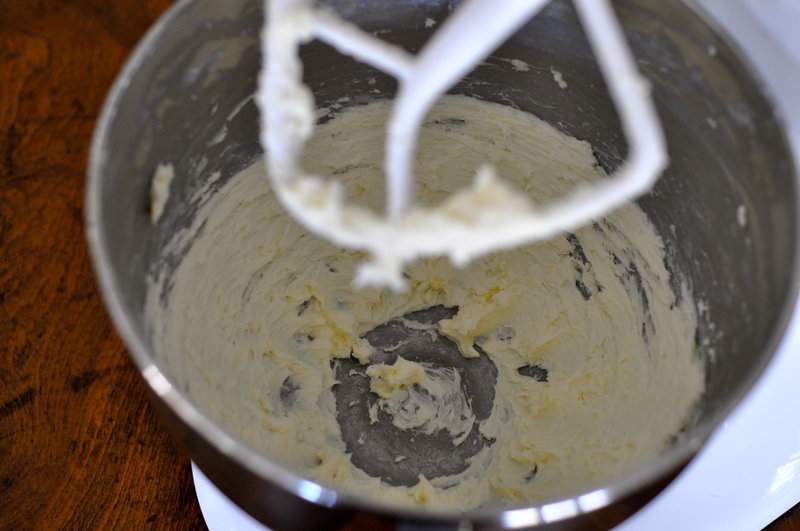 Sifting makes it light and fluffy again before using it in the batter. 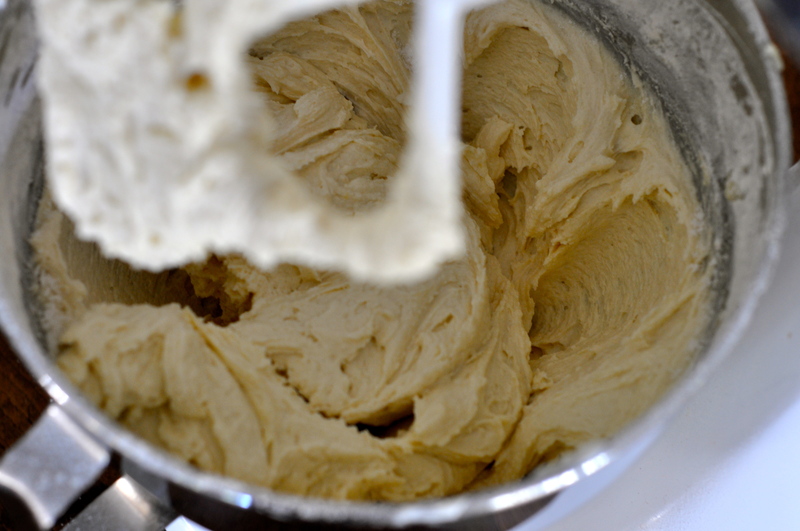 The flour mixture and sour cream are then added to the batter in alternating stages, mixing after each addition. 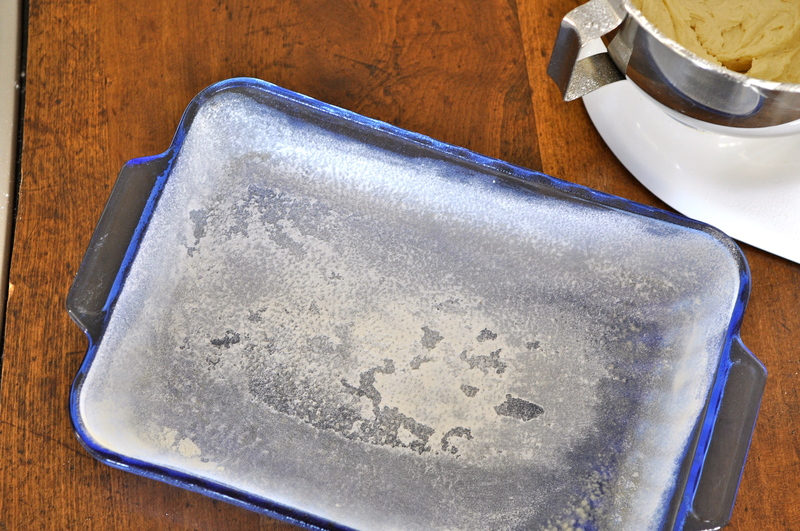 This is another essential step to ensure a light and fluffy coffee cake. 1/3 of the flour mixture, then 1/2 cup of sour cream, then 1/3 of the flour mixture, then 1/2 cup of sour cream, then 1/3 of the flour mixture. After each addition mix on medium speed for a few seconds until it is incorporated into the dough. The batter will now be very thick and creamy. 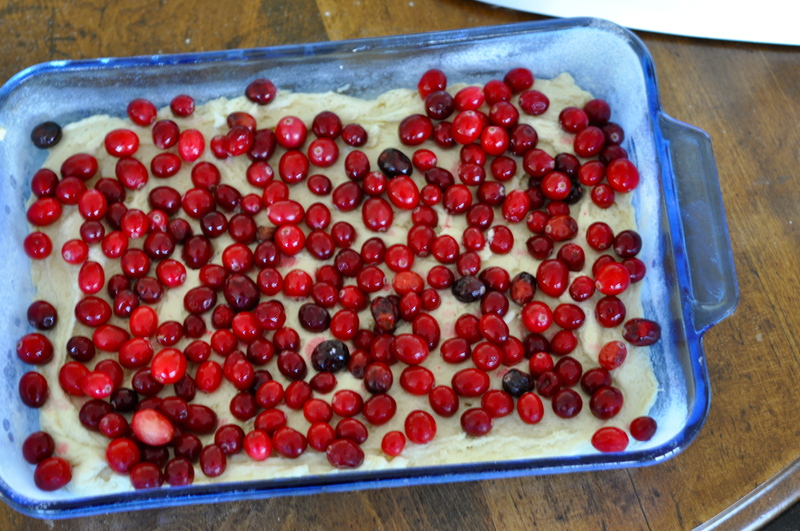 Sprinkle the fresh whole cranberries on top of the batter. 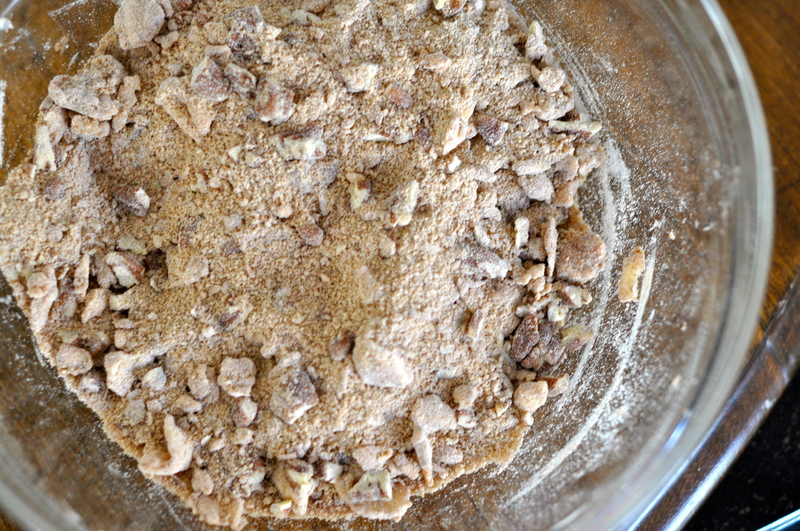 In separate bowl, prepare the Streusel Topping next. Slice 4 TBSP of butter into pats. 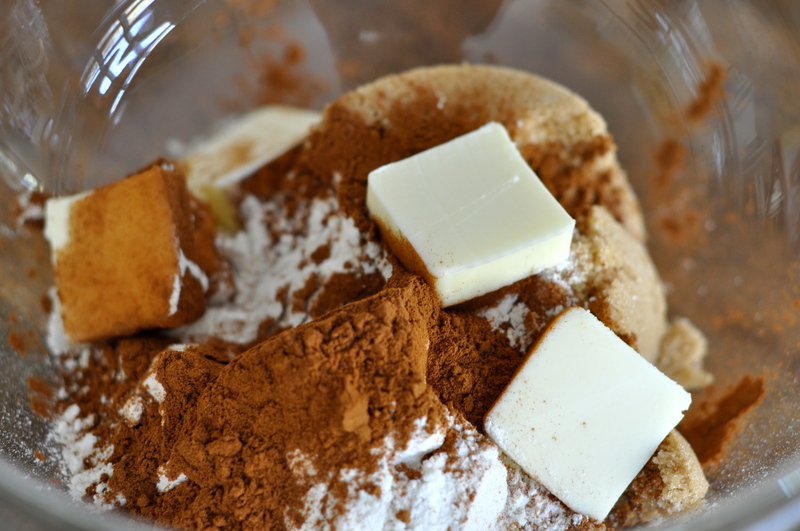 Toss the butter, brown sugar, flour, and cinnamon together in a small mixing bowl. 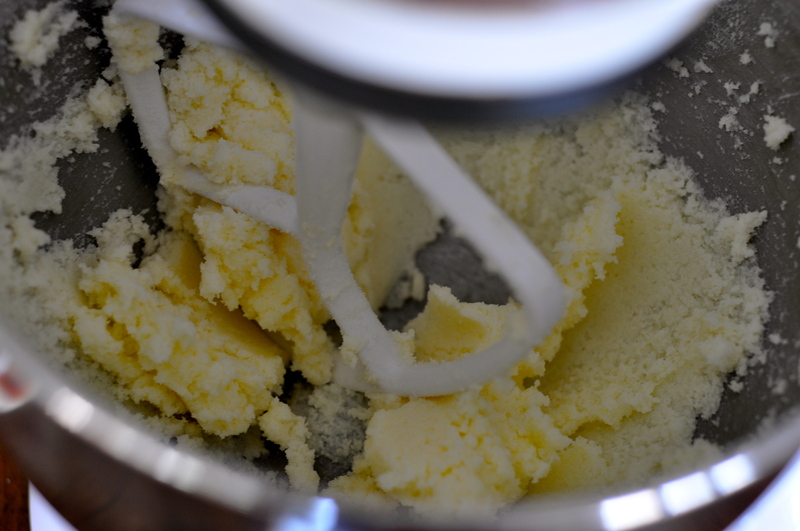 Cut in the butter with two knives or a pastry blender until the mixture is crumbly and the butter pieces are the size of a small pea. Stir in the chopped walnuts or pecans. 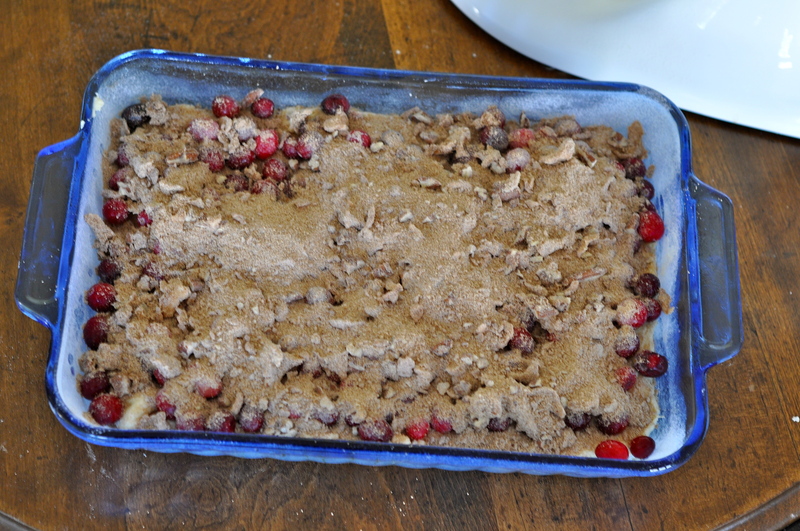 Sprinkle the Streusel Topping over the cranberries on the coffee cake. Bake the coffee cake for about 45 minutes or until a knife inserted in the center of the cake comes out clean. Cut into squares. Enjoy! On the side, sift the flour, baking soda, baking powder and salt together. I like to sift my dry ingredients together onto a sheet of parchment paper. Then when it is time to add the flour mixture to the batter, I pick up two sides of the parchment paper, position it over the mixer and pour the flour mixture in. 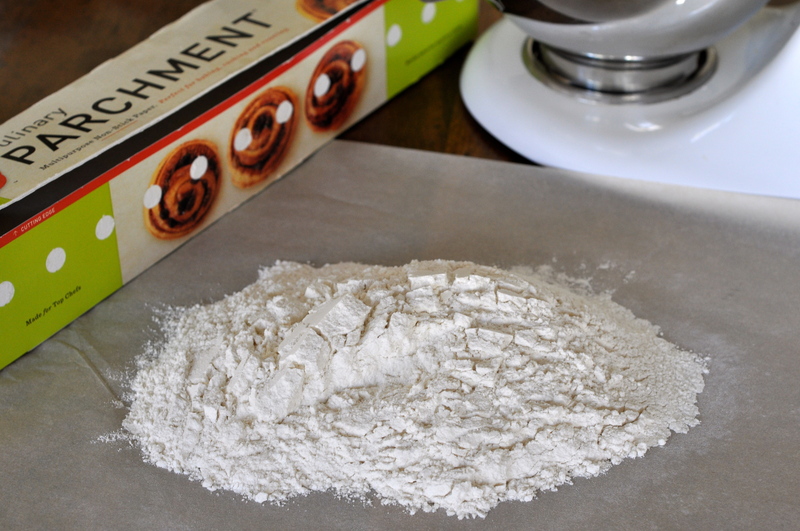 Flour can compact and become dense when it sits in the storage container, that’s why it is important to sift. 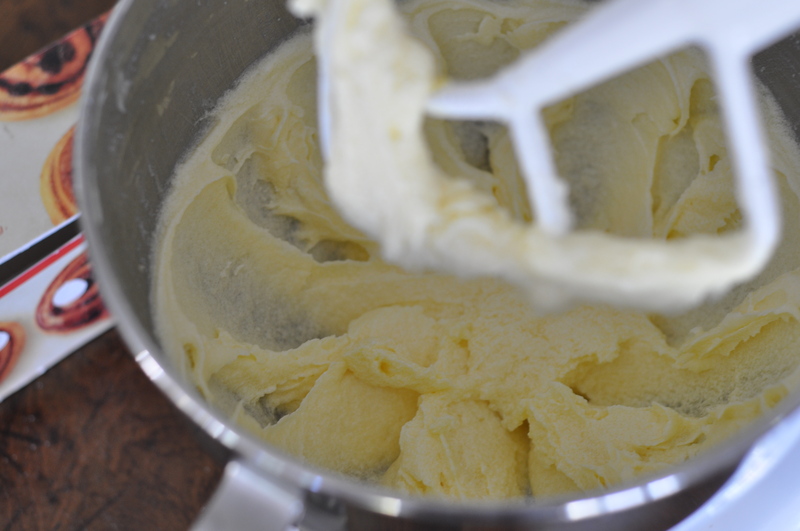 Sifting makes it light and fluffy again before using it in the batter. Bake the coffee cake for about 45 minutes until a knife inserted in the center of the cake comes out clean. Cut into squares. Enjoy! Yummy as always Cathy…But i am thinking you should also include our famous Cosmo recipe! I’ll take a piece. 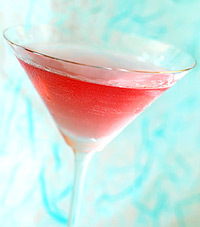 And one Cosmo. Yum and yum.